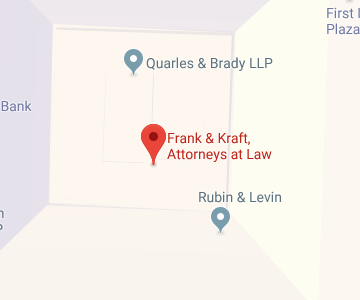 Frank & Kraft provides legal representation to clients in and around Greenfield, Indiana. Our legal team will work closely with you to identify the tasks you need to accomplish in planning for your future and we’ll help you use the right legal tools to accomplish those tasks. You may be surprised to discover that the services elder law attorneys and estate planning attorneys provide go far beyond just making a last will and testament. We can help with asset protection, incapacity planning, retirement planning and more. It’s important to think about for what will happen to you as you age and to make plans to protect yourself and your loved ones in case of incapacity or in case of tragedy. Our legal team will discuss your goals with you, create a customized plan, and help you to use tools like IRAs to save for retirement and trusts and powers of attorney to plan for incapacity or to plan for your passing. There is no guarantee of what life holds, so you should give us a call today to find out about how a Greenfield elder law attorney can help you to be prepared for anything. Greenfield, Indiana is located within Hancock County and it is the county seat of this Indiana county. More than 20,000 people lived in Greenfield as of the most recent census, and Greenfield’s Center Township is an especially popular place to reside. Greenfield was first incorporated as a city in 1876, and although the population has grown rapidly since the city’s origin, there are many locales in Greenfield that are listed on the National Registrar of Historic Places. According to estimates from the most recent census, 28.6 percent of all households in Greenfield, Indiana, was made up of an individual who was living alone without any other family members. The most recent census also revealed that 10.8 percent of households were comprised of a person aged 65 or over. If you are a senior, whether you live with family or otherwise, you may need to take advantage of services or programs at some point to enhance your quality of life or to help you to stay healthy. If you have intensive needs, such as the need for long-term care or nursing home care, you should talk with Frank & Kraft about whether our legal team can help you to qualify for Medicaid coverage of care or for care through the Veterans’ Administration. If the level of care you need is not as substantial, you can also benefit from looking into community programs and services in Greenfield. For example, Hancock County Senior Services is a community-based nonprofit that serves more than 1,145 residents who are elderly or who are disabled. The Greenfield Indiana Area Chamber of Commerce also provides information on services targeted towards seniors in Greenfield. You should talk with an experienced attorney about services and programs you could be eligible for to stay connected to the community, take part in social programs, or get help with transportation and meal service. Taking advantage of programs could help you to stay healthier and more independent for longer and could enhance your quality of life. There are courts in Greenfield which allow for family members to protect their loved ones if they become impaired due to age or infirmity. If your loved one is physically or mentally ill and not able to care for himself, you can go to court and have a guardian or conservator named. The guardian or conservator can make decisions on behalf of the incapacitated person and can manage the wealth of the incapacitated person so it is kept safe. The same court which handles guardianship proceedings also presides over the probate process, which is the formal process used to wind up the affairs of the estate and to facilitate the transfer of assets to new owners when someone has passed away. The court also handles problems that arise during the trust administration process. The court that handles guardianship or conservatorship cases, the probate process, and problems with trust administration is called the Hancock County Probate Court. It is located at 9 E Main St #201, in Greenfield, IN 46140 and it can be reached via telephone at 317-477-1109. It is beneficial to have a lawyer representing you if you are going to this court to try to get a guardian or conservator appointed so your attorney can argue on your behalf about why your loved one is incapacitated and why you should be named guardian. An experienced attorney can also provide help to the executor of an estate, heirs or beneficiaries, and other interested parties in the probate process, like a person who wishes to contest a will, and can help when there are concerns about the trust administration process such as whether the trust administrator is fulfilling his fiduciary duty. An attorney can also provide assistance in protecting your family from having to go to court by making an estate plan so the probate process isn’t necessary and by making an incapacity plan so no guardian or conservator needs to be named. A Greenfield Indiana elder law attorney at Frank & Kraft can provide you with assistance if you must go to court for a probate or guardianship matter, or if you want to make an estate plan or incapacity plan to keep your family out of court. We can also help with a wide range of other issues, including making a retirement plan, protecting your assets, planning to provide for a disabled loved one and more. To find out all about the services our elder law and estate planning attorneys offer to Greenfield residents, you can join us for a free seminar. You can also give us a call at 317-684-1100 or contact us online at any time for personalized help making your plans. Call now to get your plans underway.